Yesterday I covered how those who took the Google Power Searching class were upset they didn't immediately receive their printable certificates upon the class finishing. 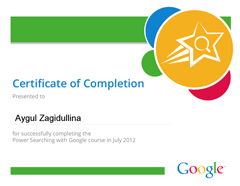 Well, several hours after writing the story, Google indeed sent out the certificates to those who participated and completed the online Google searching course. I am not sure when or if Google will continue to offer these courses. Aygul requested "more advanced courses." From the looks of it, the course was pretty basic and any SEO should have easily been able to score a 100% on it.